Last April, The City of Detroit Water and Sewerage Department made a press announcement of a controversial water shutoff plan disconnecting 140,000 residents which is 40% of the Detroit population from water. Without sufficient warning to customers, the Detroit Water and Sewerage Department, then managed by Jones Day bankruptcy attorney, Kevyn Orr, began shutting off water services to residences which owed $150 or more. However, Orr, then Detroit’s Emergency Manager, kept the water overflowing at vacant houses and businesses with bills in the tens of thousands of dollars. Kevyn Orr’s water shutoffs made international news showcasing Detroit as a third world country. His water management plan sparked local, national and international protests bringing the United Nations to declare Detroit the site of a Human Rights Emergency. Orr finally appointed the elected Mayor, Mike Duggan over the city’s water department. Since the return to Democracy, DWSD has had announced three moratoriums on water shut offs, two water affordability fairs and has also extended their customer service hours. There have also been three rate increases so far also. With more rate increases looming, the question remains: How do we keep water services affordable for everyone? Making payment plans affordable is key. Consider a Detroit disabled respiratory patient on 24/7 oxygen. She lived in Section 8 housing, with an income of just over $600 a month. The water bill in her 2 bedroom home was running $340 dollars a month due to leaky plumbing. Her Section 8 landlord refused to make repairs. Mold covered the walls of her home. Exhausted after a few steps before she needs to sit down again, the search to find a new place was difficult. Somehow she braved the long lines at the Cobo Water Fair and was put on a 2 year payment plan to pay $470 dollars a month, plus her current bill. Her water stayed on, but she knew it would be impossible to stay on the plan. She would have to forego water or starve. She came to DWB, which had a booth at the event, for help. Mayor Mike Duggan’s office was made aware of the circumstances, and worked to help. DWB promises to keep the names of all the many who come to us confidential, but she wanted at least her story told. After meeting so many Detroiters, the problem we see is three-fold. First, residents should not be forced into plans that are unsustainable: agreements should be no more than a small percent of family income. Second, there are many thousands of struggling families in the city who are out of work, disabled or on fixed incomes. Third, older homes have older pipes and plumbing repairs are expensive, often leading to phenomenally higher bills. Detroit Water Brigade has a volunteer plumbing team, however the volume of calls seems insurmountable. The sad reality is that Detroit Water Sewerage Department lawyers under Orr held a secret that we are all realizing now. Hidden in the plan was fine print that residents could not ever dispute bills which occurred prior to the plan. Many signed their rights away. One family came to the department questioning bills which had reached over $4,000 after only 6 months service. Leaky pipes, maybe? Yet they called a plumber, and no significant leaks were found. Some desperate families agreed to a lien on their home to keep the water on. Kevyn Orr has now left town, after pushing many families into liens and agreements for preposterous bills. The shut-off fiasco did a lot to help for his debt servicing plan, but little to answer the question about how to keep water affordable for people long term. The lesson we encourage other cities that face bankruptcy in the future to learn from our tragedy is there are real people behind the numbers. The shut offs contributed to increased e.coli, salmonella, pneumonia, and severe blood infections in Wayne County during the shut offs. There is no smell like the smell of a home without running water. While nearly everyone has a friend who got pneumonia during the water shut offs, the health crisis associated with the shut offs was not well reported. According to Homeland Security, water is a bio-security measure. Waterborne illnesses from lack of clean water and sanitation are a leading cause of death of children in the world. Anytime you remove clean water and sanitation from a community, bacteria is going to spread. Because these 140,000 people touch door knobs, exchange cash and come in contact with other people, so mass water shut offs is dangerous to the entire community. Public safety was never Kevyn Orr’s strong suit. In his defense, former City Council Member, Sheila Cockrel suggested people go to the river for water. Drinking river water and using the river as a bathroom are both unsafe, no matter how fiscally responsible you want a community to be. It is important for sensible lawmakers to seek ways to be fiscally responsible and responsible towards public health. Meanwhile, THAW, WAVE, DWRAP, State of Michigan DHS with the State Emergency Relief and other organizations are strapped for cash. Mayor Mike Duggan recently admitted “ “I have no idea how to do a bill by income. There’s no way to figure out People’s income and adjust a bill. That’s not realistic.” Mike Duggan at St Francis of Assissi Center, 4/9/15. Duggan also said “the average Detroiter will have to pay $100 this year because of unpaid water bills, and if they had not initiated their Detroit collections last year, it would be $200” Most on the program have fallen off. So why would Orr spend $6 million dollars in initiating water shutoffs to net $2 million dollars in revenue from unrealistic payment plans? Why would people be put on payment plans which amounted to 90% of their income unless he didn’t care if the Department succeeded in collecting the revenue after he left? Kevyn Orr’s program now looks to have been created simply to cook the books temporarily. A calculator and a few extra minutes of time might be all that is needed to help customer service representatives calculate a percentage of income. Should the Mayor rise to the challenge and accomplish a model for water affordability, many cities facing similar challenges will follow suit. Now that Orr is gone, we need real long term solutions. DWSD needs to stop pulling rabbits out their sleeves by shoring up the amount of money they collect before the takeover of the new Great Lakes Water Regional Authority begins July 1st. Let’s face it: Losing Flint as a Water Customer will bump up water rates. Highland Park has been sued for $24 million in unpaid water bills and Detroit hopes water shutoffs to residential and commercial accounts in Hamtramck will net $15,000. All of these sources rely upon the Detroit Water System. Meanwhile corporate Detroit owes the majority of the bad debt. Instead of going after large corporate accounts, DWSD focused on churches, schools, barber shops, and small mom and pop business owners. It won’t be long before the suburbs begin to feel the pain. Instead of band aids, and smoke and mirrors, we need a realistic and fair Water Affordability Plan for all, now. Here’s an idea: The Detroit Water Brigade suggests 2% of income monthly toward settling the past due balances for seniors and 5% for everyone else. Why not have people bring in a check stub to use to calculate a payment and extend the plan for longer than 2 years if necessary? We have the Great Lakes right here, so instead of privatization, why not sell our own bottled water from Michigan? If we don’t, someone else just might. One thing is for certain, it is time to lay aside the politics and come together to find solutions about our most precious resource. Detroit Water Brigade has a 10% Down Payment Assistance Program from our Water Affordability Fund that will give any family living without water services a chance to get on the DWSD Payment Plan. Detroit Residents are welcome to apply: No Questions Asked, No Restrictions Given and No Red Tape with the DWSD. Here is more information: www.detroitwaterbrigade.org/WAF If you are a plumber and would like to join our Plumbing Brigade, please contact us. Clean water and sanitation is a human right according to the United Nations. 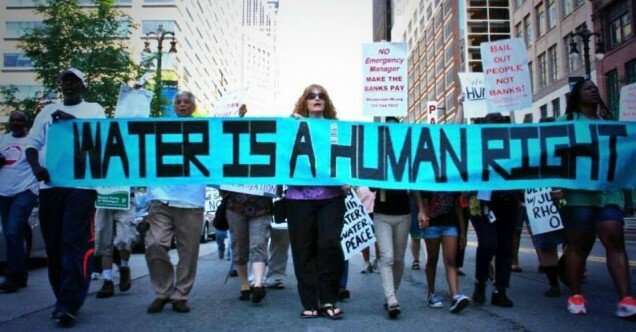 We, the people of Southeastern Michigan have a right to clean water. This involves preserving quality of the Great Lakes, the Detroit River and Lake St. Clair which supplies our water. It also means conserving water: vacant houses should not have more water than occupied homes. We all have a right to know what is happening and we each must take responsibility in preserving our resource and paying for it in a way that is fair and humane. 1. Turn The Water Back On & End Water Shutoffs Now. 2. Make Payment Plans Affordable with a sliding scale or percentage of income. 3. Officials should study the previous Water Affordability Plan and create one for 2015. 4. Consider ways to forgive the debt, for instance, through community service. Turn the water back on for Detroit. The city that invented the car, and the home of Motown is bold enough to find a way, if we only have the collective will to do so.